The level of protection required for your flock of chickens depends on what the predators in your area are. The absolute surest way to keep your chickens safe is to keep them locked up in their coop day and night which has been reinforced with chain link or metal siding. This, of course, is far from desirable for the backyard poultry enthusiast who wishes to actually enjoy his birds, so it is necessary to find the best compromise. If you don’t know what the predators in your area are before you get chickens, you will soon learn. It is possible you won’t have any problems for a while, maybe years, until they eventually find you. In wide open areas hawks (and other raptors) can be a threat. Chickens recognize the hawk outline and often will run for cover when one is overhead. They can distinguish this silhouette from non-threatening birds like vultures. The hawk will attempt to land and kill the chicken on the ground. 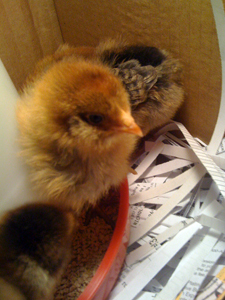 A young chick or bantam chicken may be in danger of being carried off. The only absolute protection from a hawk for birds allowed outside is to keep them in an enclosure with a top cover of chicken wire. Hawks are a low volume predator-they won’t kill more than one at a time, and more often than not are unsuccessful in their attempts. Keeping your birds in a yard with access to bushes to run into should suffice unless you have a really persistent hawk population. If your farm is near woods then you will have a much higher predator population. Woods are home to foxes, weasels and raccoons. Poultry near the woods must be locked up in the coop at night. Even though these arboreal predators tend to be nocturnal, they are able to adjust to the daytime pattern of chickens coming outside. 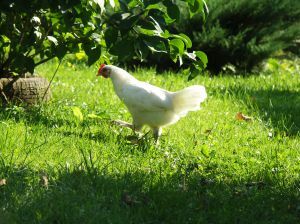 Once your chickens have been “discovered” by a predator they will return on a regular basis. 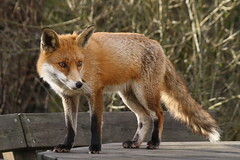 A fox is likely to visit once every week or two and will take one chicken. A raccoon can’t catch chickens in the open, but if he gets in the henhouse he can do a lot of damage just by riling up the birds, pulling out tail feathers and occasionally killing one or more chickens. A weasel is the mass murderer of poultry and can kill ten at a time and cause others to die of fright. Then, more often than not, the weasel just leaves the bodies behind. If you find decapitated chickens you know it is a weasel. They are said to like the blood of the birds. 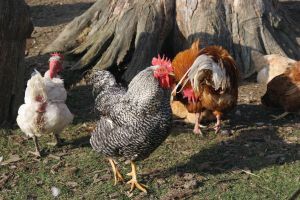 The best defense against these animals is a well-constructed coop for night time and a strong pen yard during the day. You need to be vigilant for areas where an animal could climb over or dig under. All of these predators are excellent climbers and raccoons have little nimble hands with which to untie things. A horrible predator is the fisher or fisher cat from the weasel family. We had a recent attack by a suspected fisher. It ate through the siding on the chicken coop, creating a hole the size of a softball, and killed all 45 chickens. The only defense to this is a coop reinforced with chain link or metal siding. Coyotes are another wasteful predator that will kill in high numbers. In a normal situation they are usually found in fields near water sources. They don’t prefer to come near people or barnyards with protective animals like llamas, rams or even ponies. But if a coyote is hungry they will take more risks and you must watch out for your poultry, cats and any other farm young. 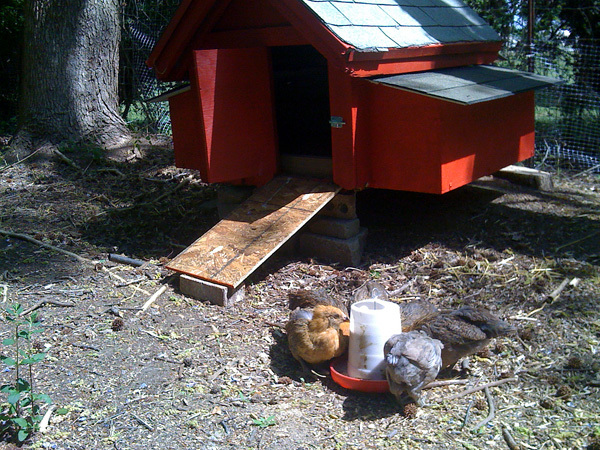 Coyotes will not trouble a coop, so locking the chickens up at night is usually sufficient. 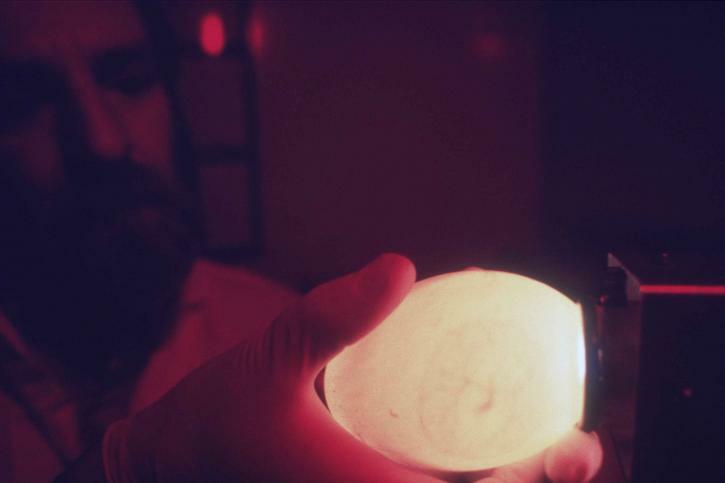 A device available on the market now is a small black box with a solar panel at the top and a single blinking red light (simulating a red predator eye). We purchased one of these boxes and hung it above our chicken coop door and left the door open 24/7 . As the sun begins to set the red light begins blinking and continues till sunrise. At the time our problem was foxes. We did not have a single loss while the box was in operation. The problem was the unit burned out in about 8 months. The rule for keeping poultry safe is generally keeping them securely confined. Usually night time confinement is enough for most predation problems. If you are in a high-risk area then day time protection may be necessary, also. It is a balance of how much free ranging you want the birds to have and what number of taken birds is an acceptable loss. I have a set of Christmas blinking lites around the pen. They use very little electric besides looking cheery all year round. 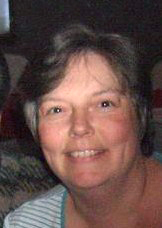 Hi,I enjoy your site. This past yr I failed my girls. I forgot to put out my moth balls (toilet bowl hangers). Deer,skunks,opossums, & the worst for me was the raccoon. and bought more of the moth hangers. so far so good, the traps remain empty, my girls are still here.. 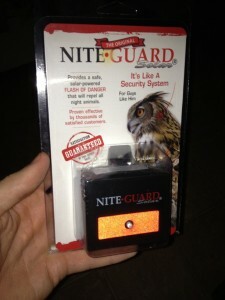 I second what Dave said about the Nite Guard. It worked perfectly for us. It will work wonders IF (big IF) your raccoon came at night-the units don’t come on during the day. Mine also burned out in less than a year which was disappointing. This is what you need to keep your chickens safe from predators at night! extensively field tested and runs on batteries that will last at least a year. Opens on time or light or a combination of both together. Check us out we have some great customer feedback! I let my chickens free range inside my chain link fenced in back yard during the day and I am having trouble with hawks during the day time. I tried the holographic tape and the wind broke it within 24 hours because it was so flimsy. Any ideas on how I can prevent daytime hawk attacks? I hate to keep my chickens cooped up inside their predator proof pen all day as they love to scratch and forage. And the boys all crammed in one pen will fight if they can’t give each other some space. I let my chickens free range inside my chain link fenced in back yard during the day and I am having trouble with hawks during the day time. The last hawk was found standing under a bush eating my favorite Silkie girl. I tried the holographic tape and the wind broke it within 24 hours because it was so flimsy. Any ideas on how I can prevent daytime hawk attacks? I hate to keep my chickens cooped up inside their predator proof pen all day as they love to scratch and forage. And the boys all crammed in one pen will fight if they can’t give each other some space. Try stringing fishing line across the area. Or maybe some statues of other animals in the area. Depending on how big the area is maybe a popup tent or some sort of shelter that can hide you chickens.